Antique buffet tables and sideboards are popular pieces of furniture because they tend to be both practical and beautiful. They were called buffet tables because their original purpose was to be a place to set up the buffet food in a dining room. Today they can be used in dining rooms, kitchens, hallways, entryways, and any other space where you want a beautiful storage piece. Buffet tables, like china cabinets, offer plenty of display space for lamps, accessories, and decorative accents, and they also often have plenty of storage space in the way of shelves, drawers, and cabinets. Buffet tables have been popular for hundreds of years and will likely continue to be so. They are classic pieces that never go out of style, and the many different designs, styles, and materials available ensure that everyone can find a piece to suit their home. Buffet tables were originally designed to store dishes, flatware, and entertaining pieces, and many people still use them for this purpose. They often have one or more small drawers for storing flatware and small items, along with larger cabinets below (sometimes with shelving) to store dishes and larger items. Buffets can be found in just about any style from French Country, to Regency, to Art Deco, and they come in just about every type of wood out there. While buffets can often be found in dining rooms it's not unusual to see them in kitchens, living rooms, entryways, and anywhere else that extra storage is needed. When buying antique pieces there are certain things to keep in mind. First of all, try to become familiar with the styles and characteristics of different antique periods and figure out which one best suits your décor. 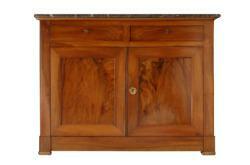 If your house is full of traditional furniture, an oak French Country buffet might look a bit out of place. Visit some antique stores, auctions, and estate sales and see what's out there and what will suit your space. Don't be afraid to seek the advice of store owners and antiques experts. When you find a piece you like look for damage such as chips, dents, and scratches. Decide what you can live with and what you can't. Serious damage is to be avoided, but some wear and tear is to be expected. After all, if you wanted it to look brand new, you wouldn't be looking at antiques. Remember that a nice finish with some signs of age is desirable while giant chips and cracks are not. The doors and drawers on antique buffet tables often have locks on them. Original locks and hardware are preferable but if they have been replaced it's not a big deal. It shouldn't affect the value of the piece too much. Before you buy try to become familiar with what other buffet tables are selling for. You want to know if you're getting a great deal or if you're paying too much. Check out other stores and auction sites and try to become familiar with pricing. Don't be afraid to ask sellers why they're charging what they are. Most will happily explain why the piece is priced as it is. If you have any antique shops in your area they are definitely the best place to start. While you can always buy on the Internet, nothing replaces being able to see and touch the piece in person. One person's idea of condition might not be the same as another's so it's always best to see the piece yourself before buying. Check the local newspaper to see if there are any estate sales or auctions going on. Buffets tend to go up for auction fairly frequently and if you're lucky you can get a great deal. If you really can't find anything check out online stores and auction sites. Make sure that wherever you're buying from has a good return policy. The description of antiques is always a little open to interpretation and you want to be sure that the item you get is the item that was described. Keep in mind also that the shipping cost for furniture can be quite high. Always factor that into your budget. Antique buffet tables add beauty and a sense of history to the spaces they inhabit. If you're thinking of getting one be sure to do the proper research to ensure you get the best piece for the best price.